A discussion in the comments on this outfit post got me thinking about the one of the major drawcards of vintage collecting ~ that one of a kind uniqueness that is only available once, represented in that exact piece of vintage. This is a common trait that defines vintage, whether it be furniture or clothing. This is often the case with vintage fashionistas, and I know for myself it’s one of the things that I adore about wearing vintage ~ the challenge of styling unique vintage pieces to create a look that is all my own. Sometimes dressing this way can draw a lot of attention, some of it negative or undesired as I wrote about here. Or, it could come across as a bit loud or costume-y which, depending on your preference, isn’t always a good thing. If you think that that means that vintage is not for you however, all is not lost! It can be tricky to dip your toe into wearing vintage pieces and blending them with your everyday wardrobe, so I’ve put together a small guide for styling vintage with modern outfits. Look for colour. Finding vintage pieces that match the colours that are already found in your wardrobe is a great place to start. For example, if you have a modern skirt that is blue with white polka dots, and you wear that with a red top, or a navy t-shirt, why not consider purchasing a white vintage cardigan that has some embroidery on it to throw over the top? Or maybe you are a purse kind of gal, and you find the perfect black vintage bag. Well, black goes with everything so no hesitations there! Look for shape. If you love full skirts and have a lot of them, there is no point in buying a vintage pencil skirt as it will probably sit in your wardrobe forgotten and neglected. If you only wear pants or jeans, try adding vintage accessories, or tops into the mix. The shape of the clothing you lean towards will help to either blend the vintage into your existing wardrobe, or make sure that you don’t wear it at all because you have nothing that works with it. Find pieces with similar silhouettes, and use that to your advantage. Look for simplicity. One of the great things about vintage is that even though there are a lot of fabulous, one of kind pieces out there, there are also a lot of simpler, plain pieces that can sort of just fly under the radar because they are a bit more basic. No, you don’t have to miss out on the fun vintage details you want to incorporate just because the piece is basic, but you can rejoice in the wearability of said basic pieces! Think about things like: coats, cardigans or jumpers, knit tops, plain or simple print dresses and skirts, black, grey, brown or navy clothing, and simple accessories ~ belts and handbags. The Clothes Horse ~ Rebecca has the perfect mix of vintage and modern pieces on her blog, and shows you how to wear practically any vintage dress with flare and chic style. Some of her outfits will take you out for a perfect evening look, and others, a comfortable day outfit that you can sport while hiking in the woods. Selective Potential ~ this blog by Tieka has a lovely range of wearable, everyday outfits which easily translate from modern fashion to mixed vintage style by swapping out outfit elements from new to vintage pieces. Annie Pancake ~ a fresh take on vintage style, Annie’s blog has got you covered for outfits that can range from baby-doll, to simple jeans and a tee, all the while adding that certain vintage flair and mashing up modern and retro for fun looks. 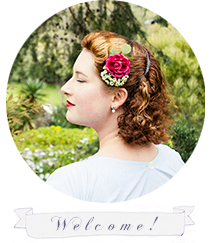 Cici Marie ~ Cici’s blog is all about creating the best of the vintage looks using modern pieces. With attention to sweet details, much like those found in the lovely old pieces of yesteryear, Cici’s outfits range from casual to work appropriate looks that can take you from week to weekend in a jiffy. Forever Amber ~ Amber’s lovely style blog features modern clothing, but again with a very vintage inspired silhouette and look. Just think of what vintage pieces you could trade out for the modern and voilà! A unique vintage outfit that is easy to wear. Simple ways to look modern when wearing vintage ~ By focusing on a modern look, incorporating vintage pieces into your fashion vernacular will help you feel less costume-y and more timeless! I hope you found this guide helpful, but of course, that’s not all ~ do you have any tips or hints for slipping vintage into your every day wardrobe? I’d love to add them to the guide if you do. What about styling unique vintage pieces? How do you work with those special items? Fantastic post, dear gal!!! I get a lot of questions from readers on this topic and generally suggest similar things, in conjunction with mentioning that one really helpful way to start wearing vintage is to pick vintage and/or repro pieces that are extremely similar to items one is already comfortable in. As you grow, in turn, comfortable in those items, begin branching out and weaving a new piece or style in here for there. For many folks gloves and hats, for example, can be intimidating, but if you start with one or a pair in a neutral hue, perhaps in a partially vintage/partially modern outfit, they can quickly grow on you and feel less conspicuous both to others and yourself. My wardrobe is a mix of genuine vintage, vintage reproduction, 80s does 40s and 50s, vintage appropriate, and a small number of modern pieces (that aren't overly vintage-y looking and which, objectively, see the least amount of wear by far) all of which I usually pick and chose from the create the sort of vintage or vintage inspired look I'm going for. I'm a huge believer in utilizing all of the cool fashion options that we're fortunate to have our disposal and also in that something doesn't have to be vintage to look the part. If you know what look (say, 40s swing) you're going for, you can often create an outfit that does a very good job of looking the part with little to no genuine vintage involved, if going that route is easier, preferable, or simply better suited to the circumstances. Thanks for putting this great post together. I'm sure a lot of folks will find it very useful! Ooh, that's a great tip Lisa! Thank you for sharing! I think it really does help sometimes NOT to think of clothing as "Oh, that's vintage" or "Oh, that's modern" but to take a step back and honestly ask yourself ~ "Do I like this? Will I wear it?" And then you can answer the why/why not, and if you don't like it; don't buy it! Even vintage lovers can get caught up in the whole ~ "oh, but it's vintage so I must have even if I don't really like it" thing ~ but that's not helpful. Buy stuff you love, and you won't regret it, even if you do only wear it every once in a while. These are great tips and I'm so excited to find some lovely new bloggers to check out too. I'm still a toe-in-the-water vintage dresser, and it's nice to have some inspiration for "vintage light" style.